Florence Crauford Grove, William Edward Hall, Reginald Somerled Macdonald, Montagu Woodmass, Melchior Anderegg, Jean-Pierre Cachat and Peter Perren. The Dent d’Hérens lies to the west of the Matterhorn, and is linked to it by a four-kilometre ridge. The approaches are long from all sides. The east ridge is actually one of the longest in the Alps. 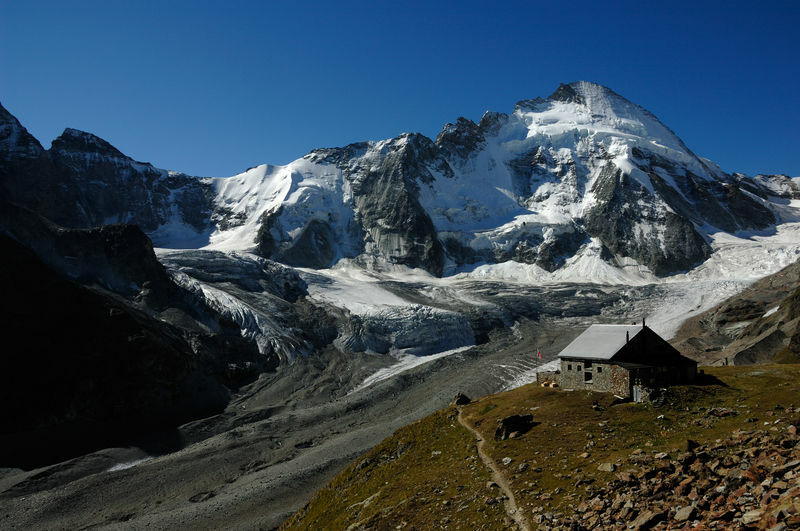 Visitors need to hike out of Zermatt in order to see this 4,000-metre summit, which lies well hidden: one option is the path from Zermatt to Schönbiel via Zmutt. The name Dent d’Hérens has been official since the publication of the Dufour Map (1845–1865), and is derived from the name of the Val d’Hérens. There was probably some confusion with the name of the Dent Blanche, because the inhabitants of the lower Val d’Hérens called the mountain Dent Blanche, while the inhabitants of the upper valley called it Dent de Rong or Dent d’Erins. The Col d’Hérens was one of the most important glacier passes of the Middle Ages. It led to St. Martin in the Val d'Hérens and was the easiest and shortest way from Zermatt to Sion; many Zermatt families had settled in St. Martin. The documented annual processions to the bishop’s see at Sion, undertaken by a priest and eight men, also followed this route. The Little Ice Age led to the abandonment of this pass. Today, the Col d’Hérens lies on the famous Haute Route between Zermatt and Chamonix. During the Second World War, this was completed in a single stage for the first time, in order to test the operational capability of the mountain brigade. Today, it forms the route of the legendary “Patrouille des Glaciers”, the world’s toughest mountain race.